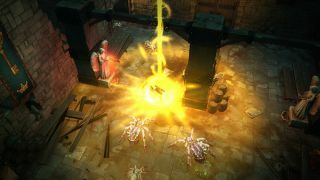 After five productive months spent in Early Access, ARPG Victor Vran is set to officially release on July 24. Developed by Tropico devs Haemimont Games, the game has been feature complete since July 2, so I guess you could go buy the Early Access edition right now if you wanted. The ARPG field is a crowded one, but Victor Vran claims to be bringing a "fresh perspective" to the genre. You'll be playing as the titular Victor Vran, yet deep character customisation appears to be one of the game's strong suites. You'll be able to jump as well, which is always nice, if unusual for an isometric action RPG. The trailer above provides a bit of context for the ceaseless clicking you'll be doing on the game's many and varied demonic enemies. Check out some earlier gameplay footage if your interest is piqued.